Resort-Feel Option with Spa, Hot Springs, & Well-Equipped Rooms. 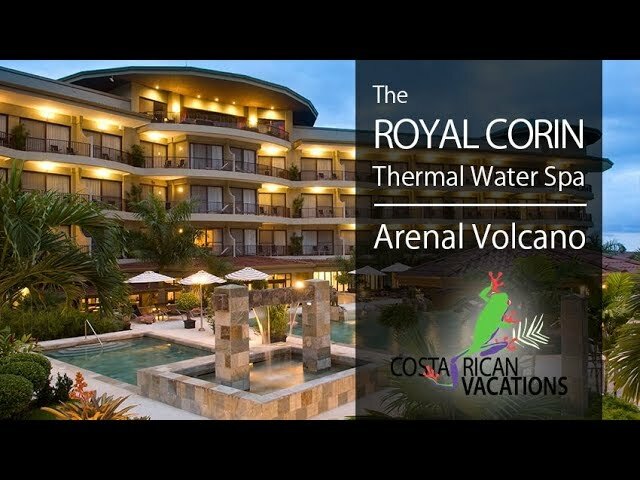 In the northern lowland province of Alajuela, the Royal Corin Resort lies just outside of La Fortuna town beneath the magnificent Arenal Volcano. The Royal Corin is a contemporary resort perfectly suited for anyone looking for an indulgent getaway with modern trimmings. This hotel would be an ideal hotel for a Costa Rica relaxation vacation package for couples or groups of friends wanting to spend some time at the spa. The Royal Corin has 54 guest rooms all with modern elegant furnishings and views of the Arenal Volcano. All rooms are equipped with TV, A/C, safe deposit box, hair dryers, minibar, coffeemaker, and terrace with views of the Arenal Volcano. Suites at the Royal Corin come with a Jacuzzi for two with an inbuilt TV set into the floor. Hotel amenities include complimentary WiFi throughout the property, private on-site thermal hot springs, and two elevators. Guests can enjoy an array of dishes at the upscale Emperador Restaurant, which serves buffet breakfast and a la carte lunch and dinner. Gluten free, lighter, and vegetarian diets can be accommodated for by the comprehensive dining options. In the evenings be sure to check out their fiery Lava Bar located on the very top floor of the hotel. Lava Bar offers both food and beverage service, so guests can enjoy tapas and pizza while appreciating panoramic views of the Arenal Volcano. For those who wish to stay in the thermal pools, the Basalto Bar serves beverages throughout the pool area. Anyone looking to stay dry can chat with other travelers at the Lobby Bar over a fine cocktail, beer, or glass of wine. Buffet breakfast is included at the Royal Corin. Guests can enjoy a variety of treatments at the Loto Spa which sits right on top of the hot springs – listen closely and you can hear the water boiling! The hotel also offers babysitting services upon request. The appropriately named Lava Bar features ambient black and red decor and serves delicious cocktails and bites at the bar. The Loto Spa offers relaxing massages, facials, and a host of classic spa treatments. Find your inner zen amongst the tricking fountains and lush spa gardens. Local tours include hiking, horseback riding, and birdwatching.